Pastor Roland Maust (right in photo) of the Uniontown, Pa., Grace Brethren Church, was recently honored for his radio broadcasting. 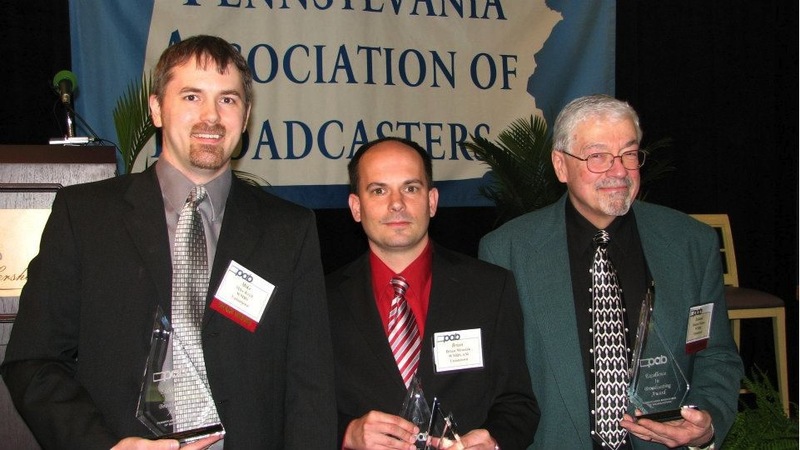 The Pennsylvania Association of Broadcasters meets annually to honor the outstanding broadcasters of the state’s 530 AM and FM radio stations, as well as all Pennsylvania TV stations. This year, it’s Excellence in Broadcasting Award for 2012 Outstanding Radio Feature Story / Report Series was presented to Pastor Roland Maust of the Grace Brethren Church of Uniontown, PA. He is seen pictured at the awards banquet in the Hotel Hershey with fellow winner Mike Krcil (left) for Best Commercial, and Brian Mroziak, station manager (center). The Grace Brethren Church has been on the air in Uniontown since 1945. As World War II ended, the National Brethren Radio Hour began airing on 8 stations across the country, including Uniontown. After 67 years, the Uniontown Grace Brethren are still very much on the air at 590 AM every Sunday morning at 8:05 a.m. In addition to the weekly “Grace to You” program, Pastor Maust also airs 60-second commercials for the church, as well as “The Civil War in Fayette County” spots commemorating the 150th anniversary of the Civil War. “Grace to You” can be heard online at www.uniontowngrace.org, and will also soon be available for listening at the FGBC website. Stay tuned. Good for you, Roland. I am happy for you.